Your People are your Strongest Defense. Make Security Awareness Second Nature. The most cost-effective defense against cyber threats is an employee who knows how to avoid them. Unfortunately, the majority of staff do not. Phishing emails and online scams are so sophisticated that most employees still fall for them. Can you recognize which emails are real and which are not? Take our Phish Quiz Challenge and find out. There are 10 emails. You have 30 seconds per email to decide. Hackers know some businesses believe they are too small or inconsequential to be the target of cyberattacks. The reality is that organizations of all sizes have become tempting targets. Hackers count on your employees to be easily fooled into clicking on malicious emails, attachments, and other scams that leave you vulnerable. Security awareness is a state of mind that develops over time when learning is continual and reinforced. This principle is at the core of the Phishgoggles Security Awareness Service. 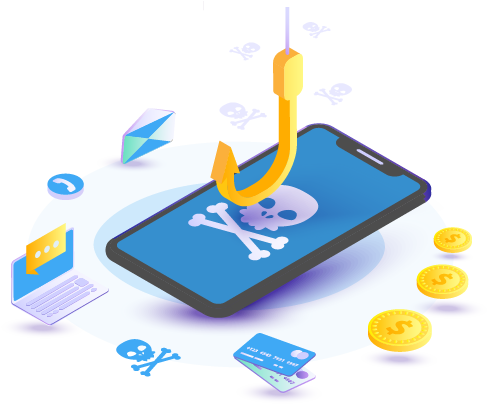 Our process is designed for lasting behavioral change—an ongoing cycle of simulated phishing and short, succinct learning modules, supplemented with news, alerts, tips, and immersive content, tracking and reports that show the sharp decline in risky behavior. See how it works. See why it works. Request a demo. © 2019 Phishgoggles Security Awareness Service™. All Rights Reserved.